Frugal and Thankful: Food waste and a menu, week 12/30-1/5. Food waste and a menu, week 12/30-1/5. How's your week starting? Are you ready for the New Year? Gorgeous, right? Are you getting tired of winter already too or are you enjoying every minute of it instead? This is also the last time this year to keep track of our food waste. Unfortunately, I'm not ending it with a nice big zero. Still, with all the Christmas celebrations and parties - read, lots of leftovers - we only threw away two pieces of pita that got moldy. I'd say, not bad at all! Are you making anything special for the New Year? I am going to have to try that busy day casserole. I hope you had a great holiday! 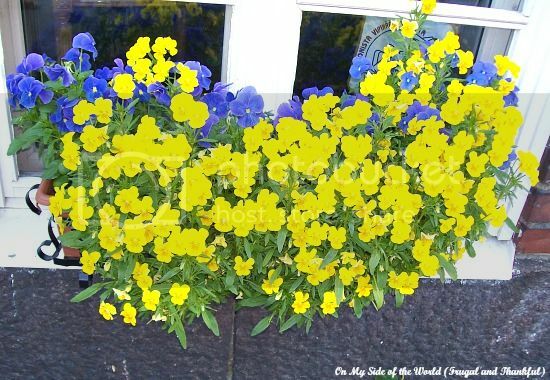 I can barely get past the picture of the pansies! My eyes are desperate for some colour! Thank you Lena for all of your helpful and supportive words - it made a big difference having the support of everyone. Thank you. I am more than ready for 2014 too.